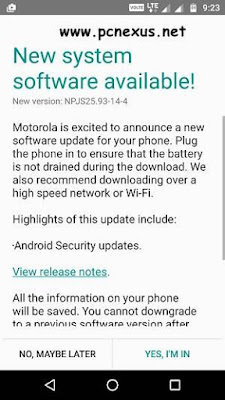 Good news, Motorola has just released a minor update for the Moto G4 Plus. This new update is the March Security Patch update with build number NPJS25.93-14-4. It carries a size of just 40 MB. This new update is not the android 7.1.1 update. It is just a security update that fixes android security vulnerabilities up to March 1st 2017. Battery performance has been improved a little bit. This update doesn't fix the screen burn issue. We hope that Moto G4 Plus get a screen burn fix in the android 7.1.1 update because screen replacement is not a solution and the problem comes back within a month. To update you Moto G4 Plus go to 'Settings>About phone>System updates'. When you see the OTA update tap 'YES, I'M IN'. This volte tab disabled for me and this update fixed and now the volte tab back. Since this update my phone starts lagging in almost every screen, whether it is an app out just the system settings. Have you installed any antivirus app? Since the launch of this phone I am just listening complaints from Moto G4 users. Not a single user called this phone a good phone. Please use a cache cleaner app. No I didn't installed any antivirus nor did I use any cache cleaner app. It is a nice phone but this last security update has made the phone slow. Go to 'Settings>Developer options>Running services'. Here check how much RAM is being used by the android system and apps and how much RAM is free. If you find heavy RAM usage here then find that particular app from this app. Uninstall it if not needed else clear its data to reset it.